Back in October I mentioned how we were going to be in a lower tax bracket this year compared to last year and most years going forward. We're dropping from the 28% tax bracket all the way to the 15% bracket because of much lower income this year. Going forward I expect us to be in the 25% tax bracket in most years so it makes sense to try and take advantage of the lower rates while we can. As such it would make sense to maximize our capital gains this year since we would pay 15% on short term gains and 0% on long term compared to the expected 25% and 15%. However, there's still the opportunity to do some tax loss harvesting as well. The downside to doing tax loss harvesting though is that we'll get a bigger benefit out of it in the future when we have higher tax rates. There's a lot of factors that go into the decision making process when considering whether the harvest tax losses or not. 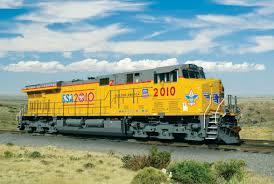 One holding that I'm considering doing tax loss harvesting on is Union Pacific (UNP). I originally purchased 2 different lots of Union Pacific at much higher prices in June of this year at $101.81 and $97.49 per share cost basis', respectively. The current share price is down at $83.99 which means the position is sitting on a 15.87% short term capital loss. I have received one dividend payment though that helps to ease the sting slightly that bumps the total return to just a loss of 15.32%. I don't want to let anything other than company fundamentals influence my decision, but seeing that kind of loss, with the opportunity to improve the situation, is something that catches my attention. The way I see it there's 3 options. 1) I can do nothing and collect my dividends in cash. 2) I can do nothing and reinvest dividends back into the company at better prices. 3) I can purchase shares at current prices and sell some of the expensive shares in order to capture the loss on the taxes this year. 4) I can sell out completely and move on to other opportunities. Option 4 isn't really appealing to me because I'm very bullish on the railroads over the long term. The entire industry is an oligopoly with just a few major players. Plus rail is too efficient of a means for transporting large quantities of goods over long distances to see it disappear. So that leaves me with options 1, 2, and 3. One and two are essentially the same thing except I could I would be building up my position by reinvesting dividends as opposed to collecting the dividends in cash. Option 3 is the trickiest to figure out. The company is facing lots of headwinds with pretty much every segment seeing declines throughout the year. Coal, grains, oil, heavy goods. Everything has significant short term headwinds with some facing long term headwinds, namely coal and the declining use of it for energy production. Oil could also be an issue because once pipelines are put in place they are far superior to rail, so oil transport will only return if new fields are discovered that don't currently have pipelines nearby or the existing pipelines are at full capacity. That's a troublesome spot to be in; however, I think these things will work themselves out over time whenever the economy gets moving forward again. I wanted to run through a current valuation analysis using the analyst forecast to see what kind of return could be generated. The following table shows the current analyst estimates for earnings per share through 2017. In order to get an estimate for 2018 I used 3.0% growth for the low earnings estimate and 5.0% growth for the mean estimate. I also came up with estimates assuming just 3.0% annual earnings growth starting from the mean estimate of 2015 earnings. Obviously there's a wide range of earnings between these three scenarios. Over the last 10 years Union Pacific's payout ratio has ranged from 21.6% to 39.3% with an average payout ratio of 28.0%. For fiscal year 2015 the payout ratio is forecast to come in at 38.8%. Obviously there's no way to tell what management has in store for the payout ratio; however, given their lengthy history of paying dividends I'll assume a 38% payout ratio is maintained going forward. 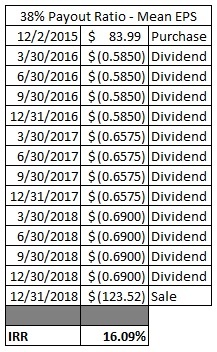 The following table shows the annual dividend forecasts using payout ratios of 35%, 38%, and 40% for fiscal years 2016, 2017, and 2018 based on the mean earnings estimates. If the average analyst estimate for earnings per share is hit then investors at current prices would be in line to reap big rewards. Morningstar has the 5 year average P/E ratio for Union Pacific at 17 although currently the ratio has dipped to 14.6. The following table shows the cash flows if you purchased shares yesterday at $83.99. Just over 16% annualized returns over the next 3 years is something I like to see. That assumes a valuation of 17x 2018 earnings. At a valuation of 14x 2018 earnings the annualized return would still be solid at 9.3%. However, that's just one of the three earnings scenarios I described above. If the low earnings estimates scenario plays out the 17x 2018 earnings annualized return would come to 14.2% with the 14x 2018 earning return at 7.5%. In the conservative 3% annual growth scenario the returns still look good with 17x 2018 earnings generating an 11.2% annualized return and 14x 2018 earning generating a 4.7% annualized return. The problem is that this assumes a purchase of new shares at the price of $83.99 but I already own shares. The shares I own have an average cost basis of $99.83. The mean earnings 17x 2018 earnings return drops to just 9.6% while the 3% conservative growth 14x 2018 earnings scenario would actually show a 1.2% annualized loss. In order to harvest the losses I have two options depending on if I want the loss on this years taxes or on next years taxes. If I want the loss on this years taxes then I would have to sell the shares prior to the end of the year and then wait 30 days from the sale date before I could repurchase shares. If I want the loss on next years taxes I could purchase replacement shares now, but then wait 30 days before selling shares. If I don't wait the required time in either case then the loss would be disallowed under the wash sale rules. Since I expect to be in a higher tax bracket for 2016's taxes I'd be able to reap the most benefit by purchasing replacement shares now and then selling sometime in January. The downside is that requires that capital to be locked up until I can sell 30 days later which keeps it from being put to other use. There's also the issue of anticipated share price movement and the timing of that movement. I don't consider myself a market timer at all and honestly have no idea where the share price will be tomorrow let alone 30 days from now. I don't see many catalysts for the share price to return to anywhere close to my current cost basis over the next 30 days so there's the very real possibility to at least make an improvement on the cost basis for my position. As you can see there's a whole lot of things to consider before making a move like this just to harvest some tax losses. Especially since if I liquidated my whole position I'd only be looking at around $420 of loss which leads to about $60 worth of tax savings. I've added a questionnaire I'd love for you to answer if you don't mind sharing your thoughts on this situation. Interesting to read your thought process on this. I've been watching UNP for a while now and I'm considering adding it to my portfolio (already own some CSX). If you still like the company, I wouldn't do the tax loss sale for $420 in losses. For that much (and $60 savings), I don't think it's worth the hassle. May be a good time to average down even more. I'm probably going to sell my CMI this month. My losses are over $1000 in a fairly short period of time. That will give me sufficient savings for the effort. Plus, I like cleaning up a mistake like that. I still like CMI and may add some later. I generally prefer to buy first and then sell 30 days later. However, it seems every time I do that, it's the wrong move. There's definitely a lot of factors that go into the decision process. I could probably add some more shares given it's position size so that's always an option as well. I was kind of thinking the same thing regarding is it even worth it? $420 in loss and $60 in tax savings is kind of meh. But I could still lower my cost basis from the high level it's away for the cost of roundtrip commission so it could still make sense. Also, those losses are a bit worse now due to the large selloff yesterday afternoon. I like RBD's take - the overall savings arent worth the hassle. Like you said - you are extremely bullish on the sector, so why sell now? I'd just leave it at that and/or buy more to average down instead. Yeah it makes sense except for when you look at the actual tax savings. At that point it might not seem worth it especially since round trip commission costs would eat up about 25% of the tax savings. I'm still tempted though because I don't really see any short term catalysts so I might try and swap out to other opportunities. The share price would have to climb almost 26% before I repurchase shares for me to not at least be able to lower my overall cost basis. If I had more capital I'd just average down but it's still going to be tight so there's the question of whether there's better opportunities currently. Very nice write up on Union Pacific! UNP has been a bit of a dog for my portfolio but I still like them over the long term. Should be fun to watch things play out. PIP, I am a daily reader of yours and have followed your story for a long time. I am a huge fan. Many DGI bloggers were buying UNP, including you, when it was WAY too high. NOW is the time to buy this stock. My suggestion is to get FASTGraphs, or some other valuation tool that can help you with valuations. The basic subscription for FG is $10/month and it will immediately signal you an over priced company based on its history. What got me to comment today was that I actually bought UNP today. I cant offer any advice as to sell, except that if you believe in the company, keep it. If you don't, sell it. My only advice is to NOT buy companies until they are "undervalued" and you have a margin of safety. Even if they are great companies like UNP. Starbucks is GREAT company I want to own, but its totally overvalued at the moment. In hindsight I was early on my purchase of UNP. Especially for an industrial company that is subject to forces outside of their control. In that case I should have required a larger margin of safety although I still think my cost basis is a decent long term entry point. The reason for this post was two fold. 1) Tax savings and all the decision points that need to be made to determine if it's worth tax loss harvesting and 2) capital is still going to be tight until I would guess February which means it's portfolio optimization or sitting on the sidelines. I've already been on the sidelines since July so I'm getting antsy to make moves and I think there's better opportunities out there right now. If my own FCF was flying high then I'd just average down my cost basis and be done with it. But it's not so now I have to factor in whether there's other opportunities to improve my portfolio for the long term.